Do you need a quick appetizer recipe that’s sure to impress? Oh and did I mention that it smells absolutely delicious. This dip is quick to put together and you an keep everything you need in your fridge, freezer and pantry. Perfect for unexpected guests and the holidays when you’re busy cooking other stuff. Just throw this together, stick it in the oven and you’re good to go. 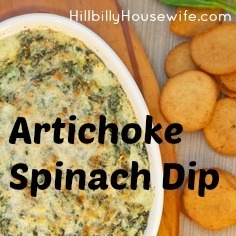 The recipe is from my latest Kindle Cookbook “My Best Dip Recipe” available on Amazon.com. Don’t tell anyone, but I’ve been known to have this with some crackers or veggies for dinner. Nothing like snacks for supper when you’re by yourself. Preheat oven to 350°. Coat an 8×8 inch baking dish with cooking spray. Mix together parmesan cheese, 1/2 of the mozzarella cheese, cream cheese and alfredo sauce until well combined. Add in pepper, garlic, spinach and artichokes, stir well. Pour mixture into prepared pan and top with remaining mozzarella cheese. Cook for 30 minutes or until bubbly and golden brown. Serve with pita strips, crackers or use as a bread topper.